So yesterday I had every intention of making the drive to my nearest Nordstrom store [it’s 2-3 hours away] to shop this big ole 40% off sale biznass, but after realizing that I had to work longer than anticipated, I hit up my girlfriend/assistant/right-hand life saver and asked if her and a girlfriend would want to make the couple hour trek for me and basically buy anything that they thought I would be interested in. Think Stitch Fix but on major steroids. Fortunately, she said yes and off they went! Well, homegirl did well and brought back a few [seven] bags of items for me to go through. So here we have it, the good, the bad and the “what the ____ is this? !” As you will see below I am starting with the hits, transitioning to the on the fence and ending with the returns. All sizing notes, links to shop and all that jazz will be below as well for your shopping pleasure. Drumroll please…. ps. For sizing info I am 5’4, 125 lbs, typically a 2 in tops/dresses and 2/26 in jeans/pants! 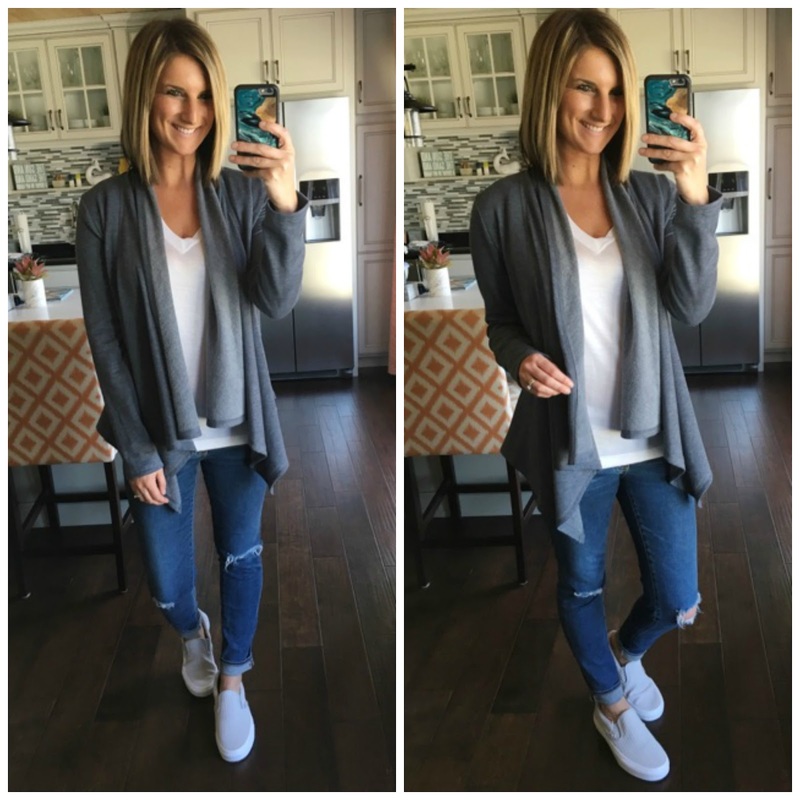 Bobeau Peplum Back Open Cardigan, 30% OFF – this baby is SO incredibly soft and cozy. I love the peplum vibe that the back has which gives it a nice flow and covers the booty. I am wearing the blue color [available in 3 options] in size small, however, I would have loved this in XS. When ordering, I would suggest ordering your normal number size (ie: 2, 4, etc)! Trouve Shoulder Pleat Sleeveless Tee, 45% OFF – I will say, this tee is plenty soft. However, I don’t love it alone as the arm holes are quick large and unless you have guns you really want to show off, it’s not the most flattering. For under cardigans like above, perfect! If ordering, I would stick true to size – the XS was pretty tight on me. 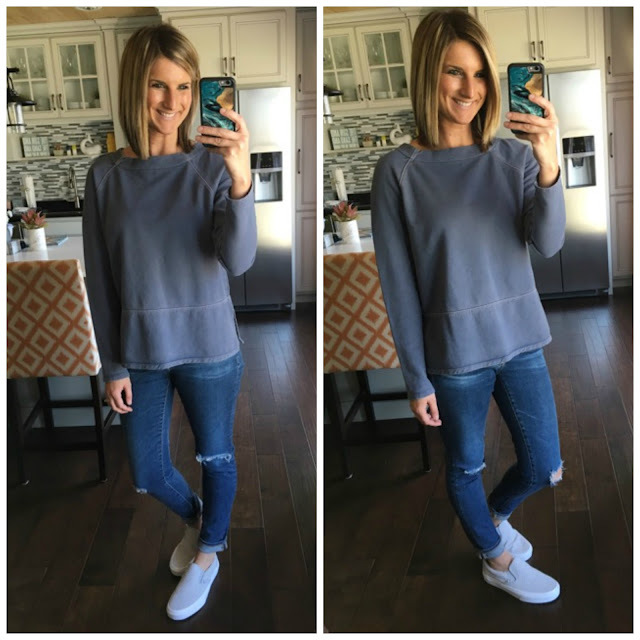 AG The Legging Ankle Jeans, 20% OFF – I am wearing an almost identical pair above [AG brand] and love these jeans oh so much! Such great quality and fit, I would order true to size! Vans Classic Slip-Ons, not on sale [but under $60!] – I love slip-ons almost more than I love my husband. I am wearing these in the microchip color, [available in all different colors], however, they are slightly large on me. I am going to be exchanging for half to one size smaller! Side note – these are my favorite no-show socks! TopShop Long Sleeve Ruffle Tee, $12 OFF – This beauty is now sold out online at Nordstrom [check back here for restocks], so you will see it is linked directly to TopShop [which still ships free, yaay!] I was questionable on this before I put it on and then BAM, I loved it. It’s super soft and cute! On sizing, I am wearing it in US 2. I would size up if in between! Vince Camuto Kensa Peep Toe Booties, not on sale – If you don’t know who the other man in my life is, it’s Vince. I’m obsessed with him and all of his fabulous little shoes. I am wearing these in almond beige nubuck leather. If you aren’t used to a heel, these are 4″ so something to consider. I would also consider sizing down half a size! 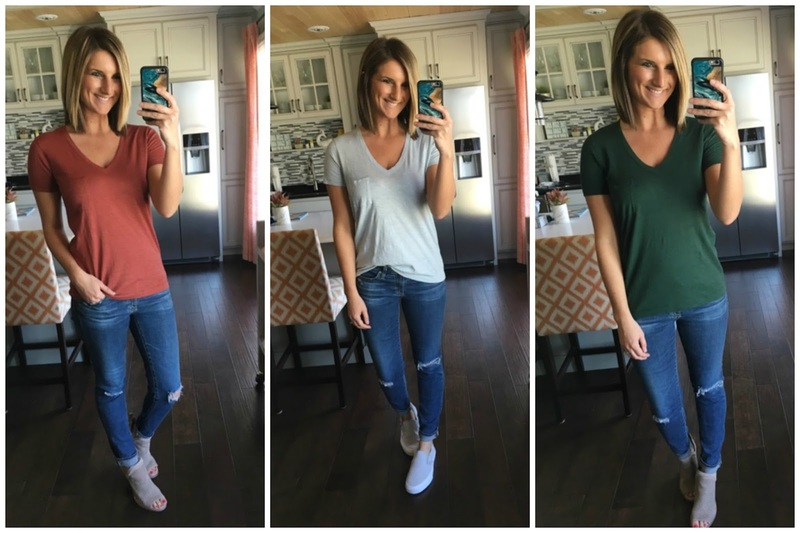 Madewell Whisper Tees, 25% OFF- Mahogany and Light Blue Here // Green Here – These are my favorite basic tees as I wear my gray and white one all of the time! I always wear them in an XS and would suggest sizing down if you go between sizes. These hold their shape great and in the colors, aren’t sheer! 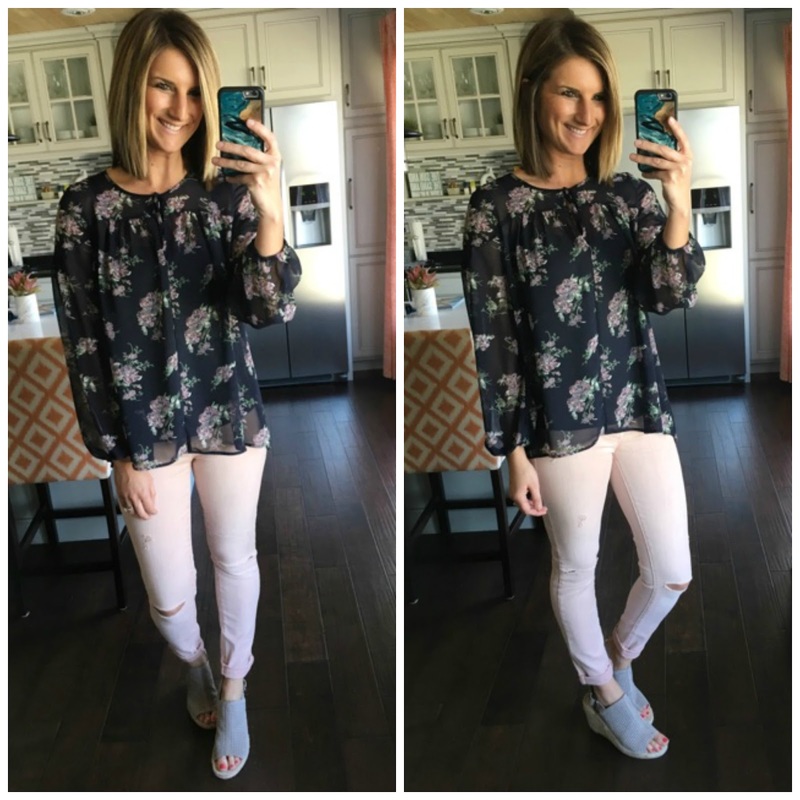 Wayf Wrap Front Long Sleeve Blouse, 40% OFF – This baby was so much cuter on than I had hoped. I don’t have a cami underneath this, however, if you are uncomfortable with the cleavage that may show through I think a cami underneath would work just fine! I am wearing this in small and it fits great. I would suggest if you are in between sizes, to go up one in this brand! Also available in light pink! Sam Edelman Hazel Pumps, 20-25% OFF – These are my favorite go-to heels for every occasion, work included! So comfortable and fit like a glove. They run true to size and come in a bajillion colors, I am wearing them in black suede here. Gibson Sheer Peasant Blouse, 40% OFF – This one surprised me too! I love the feminine floral pattern and the colors for spring. 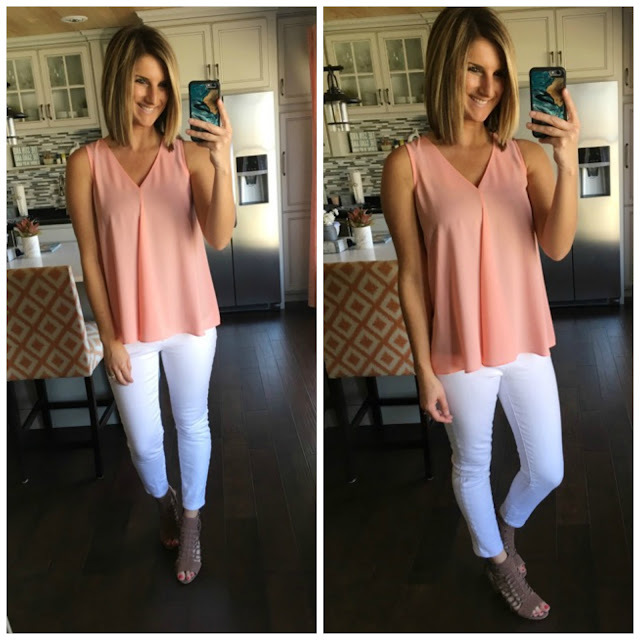 I simply paired it with my favorite go-to cami underneath and I was ready to roll. I am wearing this in a small and it fits great. Available in 3 other patterns! BlankNYC Distressed Cropped Pink Skinny Jeans, 19% OFF – The softest pair of pink pants on the planet. 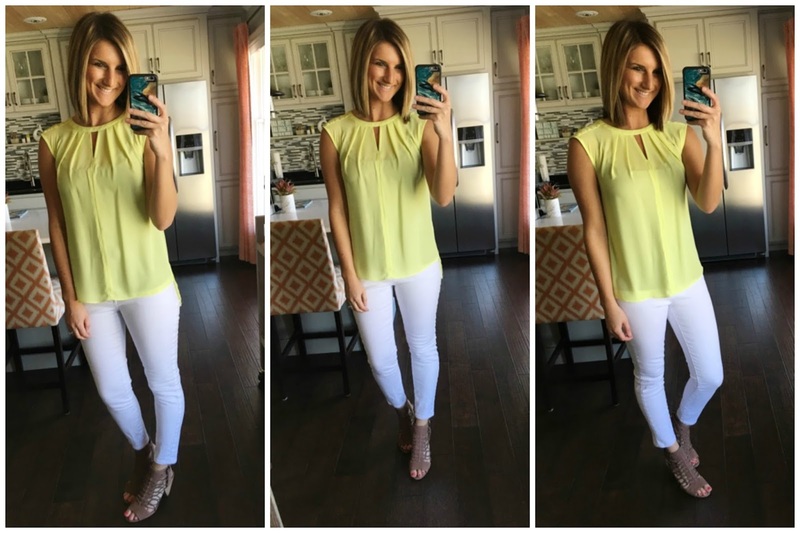 These run true to size and are so cute for spring! Caslon Sutton Slingback Mule, not on sale [but under $100!] – If you are on the hunt for the comfiest pair of wedges, you can stop searching. These are crazy lightweight and comfortable – I wore them for 10 hours yesterday moving boxes, going up and down stairs, etc and had zero problems. I am wearing them here in stone perforated kidsuede. True to size! BP Scoop Neck Boyfriend Tee, 40% OFF – This tee is crazy soft and I love the fit! I am wearing here in XS and it still has a little room. I would size down if in between! 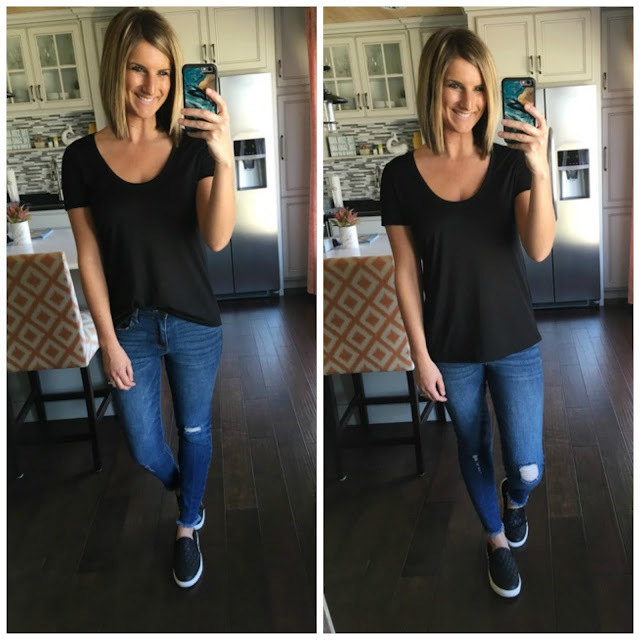 STS Blue Emma Distressed Skinny Jeans, not on sale [but under $50!] – I didn’t know what I would think about the frayed hem at the bottom but I’m kinda diggin’ it. For this price these jeans are super comfortable and fit great! True to size, I’ll be wearing these a ton! Steve Madden Ecentrcq Sneakers, not on sale [but under $60!] – I love these babies! Definitely size up half to a full size in these! Available in 3 colors! And yes, I wear these with these no-show socks! CeCe Keyhole Blouse, 40% OFF – It’s yellow, I had to have it. True to size, wearing in XS. I love this for spring and summer. I did have to wear a cami underneath but it’s still a major win in my book. Probably one of my favorites from the sale! Kut from the Kloth White Skinny Jeans, not on sale [but under $90!] 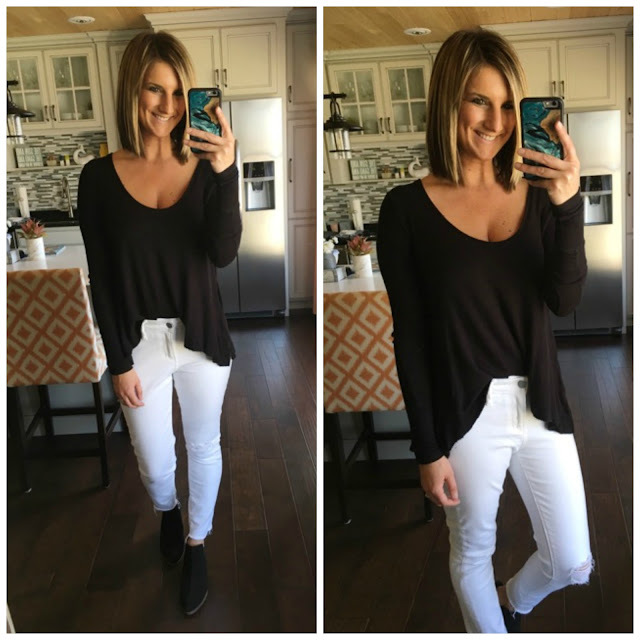 – My favorite white jeans! Not see through, perfectly cropped and true to size! Vince Camuto Evel Leather Sandals, 30% OFF – These have to be some of my favorite sandals on the planet. So comfortable, they barely feel like you have a heel on at all! I wear these with nearly everything – I would suggest sizing up half a size! Available in black too! Zella Sale – While I can’t find this on sale top online, you may be able to find it in store! 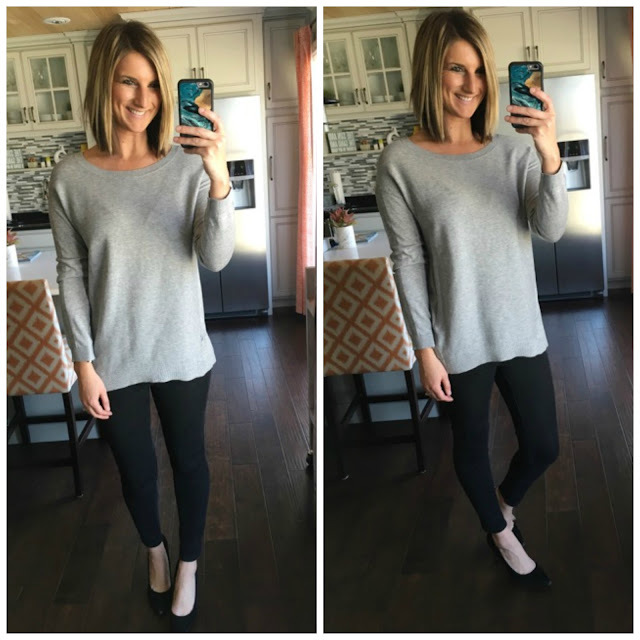 All of Zella is SUPER comfortable and well made, you can search similar sale tops here! Zella Pure Energy Seamless Bralette, not on sale [under $40] – This is a perfect bra if you are doing low key activities and don’t need all of the support that you may need when running. Super comfortable and I love the straps in the back! I am 34D and wear this in medium! Zella Stellar High Waist Leggings, new arrival, not on sale – The world could run on high waist leggings as far as I am concerned. I am obsessed with all things Zella so when I saw these in a fun spring color I knew they had to get in my closet. Couch, here I come 😉 I recommend sizing down if in between on Zella – I wear these in XS! Nike Juvenate Sneakers, not on sale [but under $100!] – Want to hear something fun? These are actually slip-on sneakers. They have a tie but yes, you really just slip them on! They are like walking on air which is always fun. Wearing in oatmeal, they run true to size and are available in many colors! 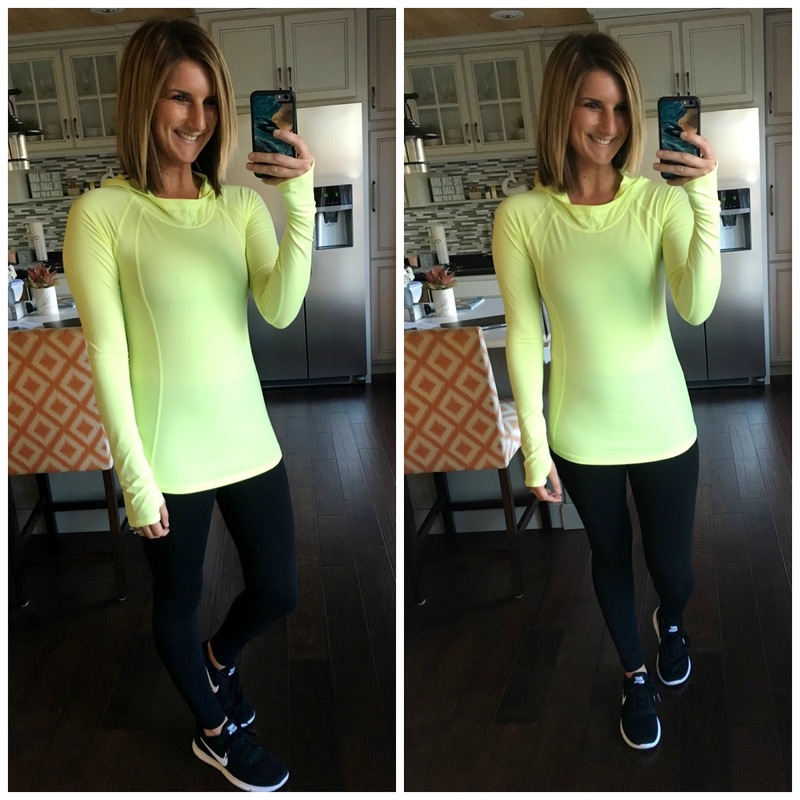 Zella Technique Hooded Pullover, 40% OFF – Available in 3 colors, this is awesome for running or walking during the cooler months! I am wearing here in XS, but need a small. I would size up one! 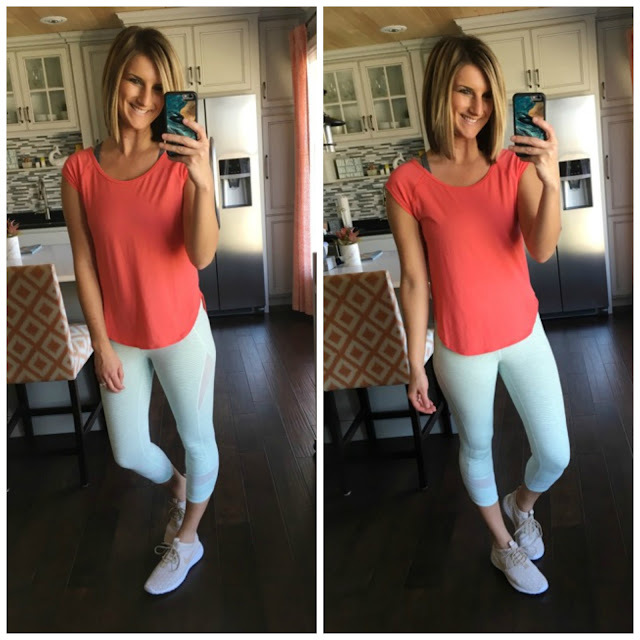 Zella Live In Leggings, not on sale – The perfect leggings [although I do prefer the high waist version more!] Wearing in XS, I would size down if in between. These stay in great shape wash after wash [I don’t dry!] Highly recommend for working out or for wearing with cute tunics and dresses! Nike Free RN tennis shoes, currently on sale! – If you don’t own these yet, I can’t recommend them more! I haven’t met anybody yet who has purchased them that doesn’t like them. So lightweight and comfortable, you may want to order up half a size! I wear my favorite no-show socks with them! 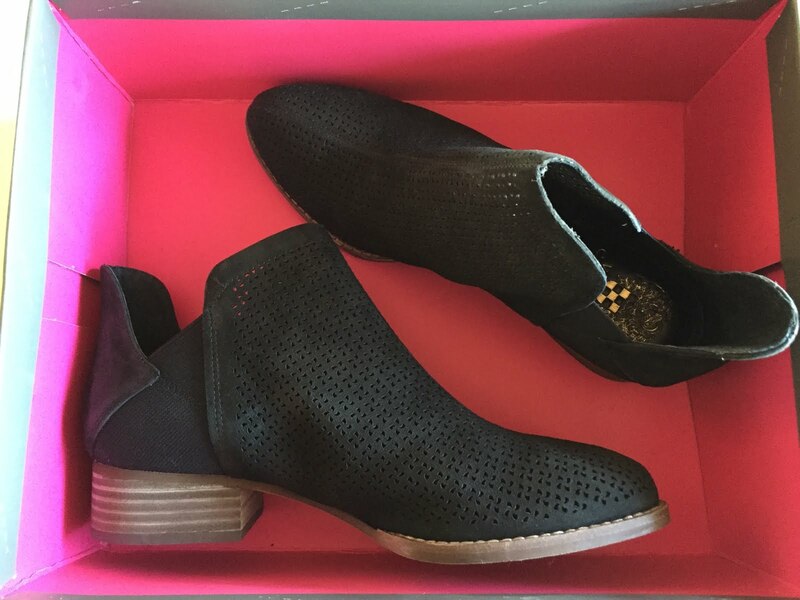 Vince Camuto Celena Perforated Booties, 25% OFF – This is going to shock you, I loved them. I did find them true to size for myself, however some say to size up! Available in 3 colors, you can never go wrong with Vince! Wayf Monroe Lace Shift Dress, 40% OFF – I love everything about this dress – the length, the lace, the color, the fit, the price, everything! I am wearing in small here and would suggest ordering true to size or if in between, going up one! Steve Madden Pampered Lace Up Heels, not on sale [under $100!] – I think these are so freaking adorable and I love the chunky heel and color options, however, I sadly didn’t find them super comfortable. They may just need broken in but for now, this lady can’t do it. Trouve Corrugated Stitch Pullover, 40% OFF – I think I like this one so much because of the simplicity of it. It really is just a great basic pullover sweater with a little touch of detail. I am wearing it here in XS and would suggest to order true to size! Available in 3 other colors! Vince Camuto Drape Front Blouse, 40% OFF – I absolutely love the color of this beauty along with the cut. I am wearing it here in XS and could most likely do a small due to my chest area. I would order true to size unless you are bigger up top, then maybe go up one if in between! 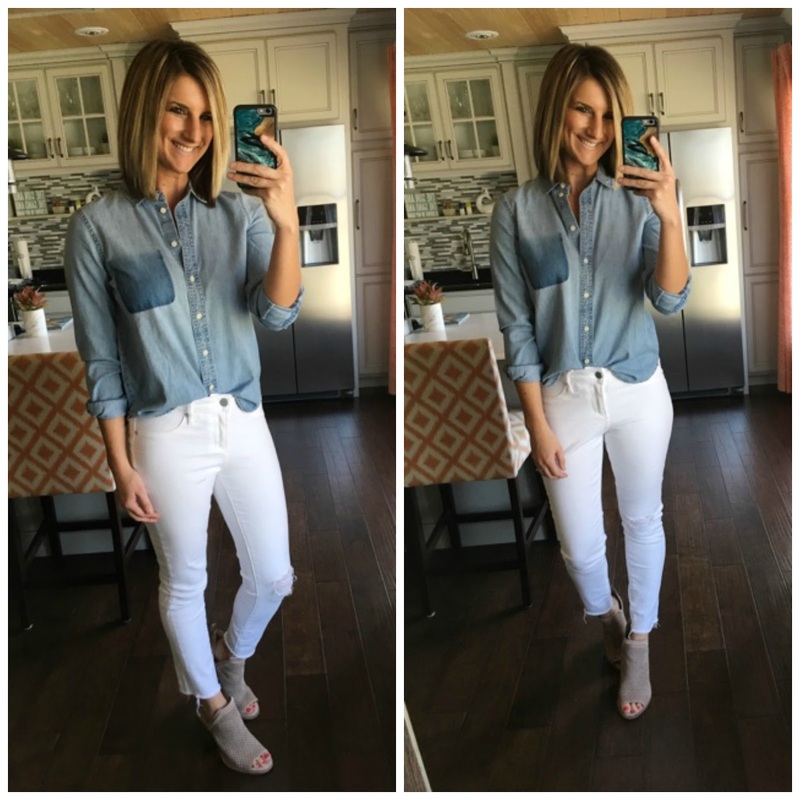 Madewell Shrunken Chambray Shirt, 40% OFF – Here’s the thing with this one, when I pulled it out of the bag I kinda hated it. And when I put it on as-is I kinda hated it. And then when I tucked it in slightly, rolled up the sleeves, left the top two buttons unbuttoned and styled it with white jeans and booties I absolutely loved it. So there we go, it’s a keeper. Wearing in small, I would size up rather than down! Articles of Society Carly Cropped Skinny Jeans, not on sale [but under $65!] – Size down as these have a good amount of stretch to them! Caslon Sweatshirt, 40% OFF – At first this was going to go under the “on the fence” category but the more I feel it, the more I love it. It’s really freaking comfortable and I kinda dig the worn look. The only thing I would advise is maybe sizing up? I am wearing it here in an XS and can’t tell if it’s right or if I need a small? Available in 3 colors, it’s great for throwing on with jeans and slip-ons! Chelsea28 Ruffle Sweater, 40% OFF – I can’t decide if I love it or hate it. The fabric felt great and had this nice chunky [yet not bulky] feel to it, it’s just the ruffle that I am like “do I love that? or is it weird?” Thoughts here? I am wearing in XS and like how it fit! True to size! 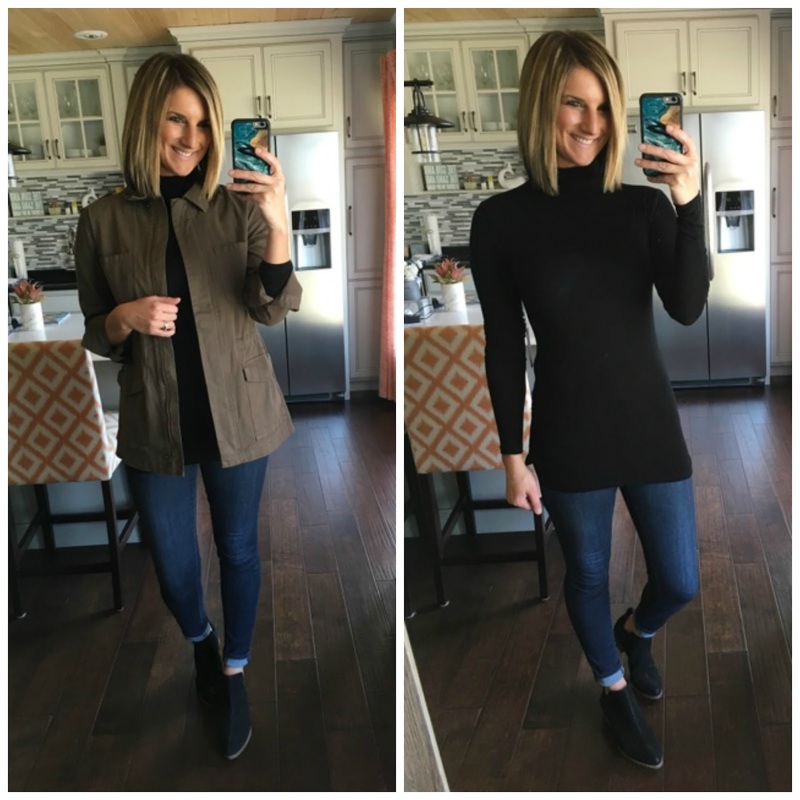 Chelsea28 Layering Turtleneck, 40% OFF – This turtleneck is really quite soft and comfortable, but it is pretty sheer and small. I am wearing in XS here and would definitely want a small if I kept this. It is good for layering [hence the name] so I go back and forth! Size up if considering this one! Available in white and gray as well! Hinge Utility Jacket, 45% OFF – I think my biggest problem with this is that it was too big. I’m wearing in small here but would definitely want it in XS. 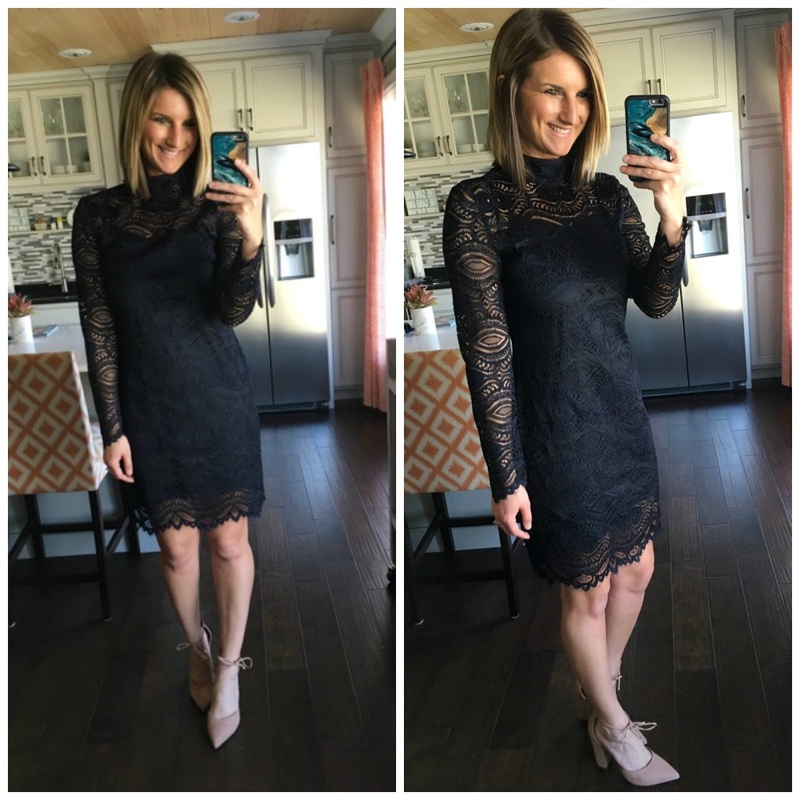 I think it could be super cute and a great versatile piece if styled right! AG Ankle Super Skinny Jeans, 20% OFF – Probably my favorite pair of non-distressed denim that I own. Super super soft and fit like a glove. These do run true to size and are awesome for those of us 5’6 and shorter! If you are taller, between 5’6-5’11 I would try this pair which is also 20% off! 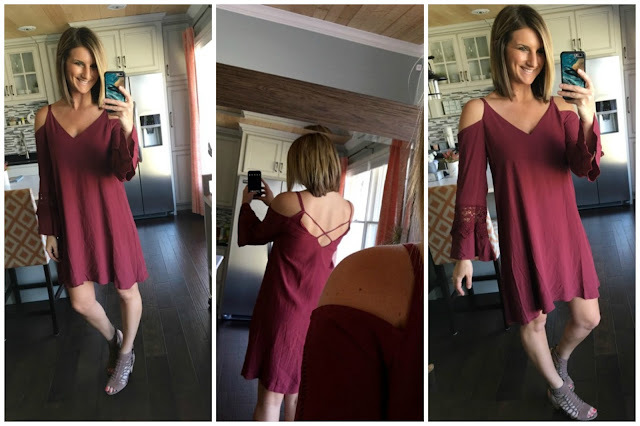 ASTR Cold Shoulder Shift Dress, 40% OFF – I actually love this dress, I think it’s just a little too big on me. I am wearing in a small here but think I would have preferred XS. It definitely has a fun boho and/or country concert vibe which is fun for summer. I am wearing a strapless bra [this one to be exact] and it doesn’t show in the back which is nice! 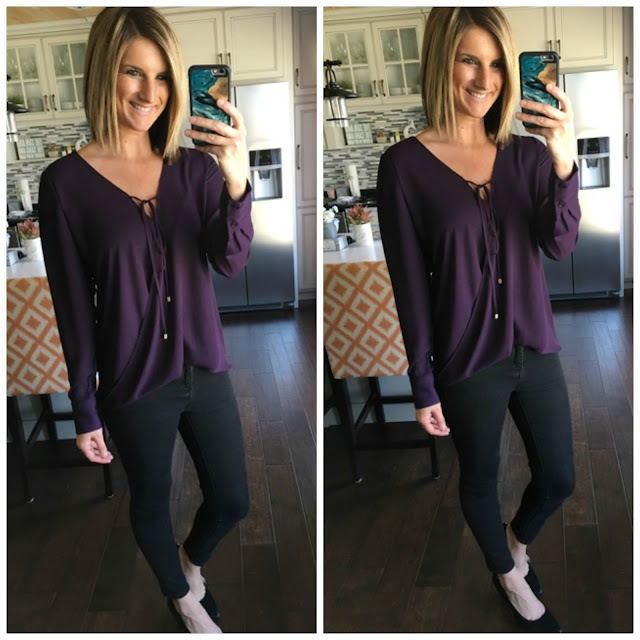 Free People Malibu Thermal Top, 40% OFF – Okay, so this shirt is probably one of the comfiest tops on the planet, but – I am not sure I am loving how it fits. It is definitely flowy and it is also definitely more on the low cut side. I could see myself wearing this around the house more than I could out. I am wearing it here in XS and think this would be the size I would want? What do you think on this one? Trouve Cold Shoulder Jacket, 40% OFF – Right out of the bag I thought “nope, not for me” and then once I put it on I started to have a change of heart. 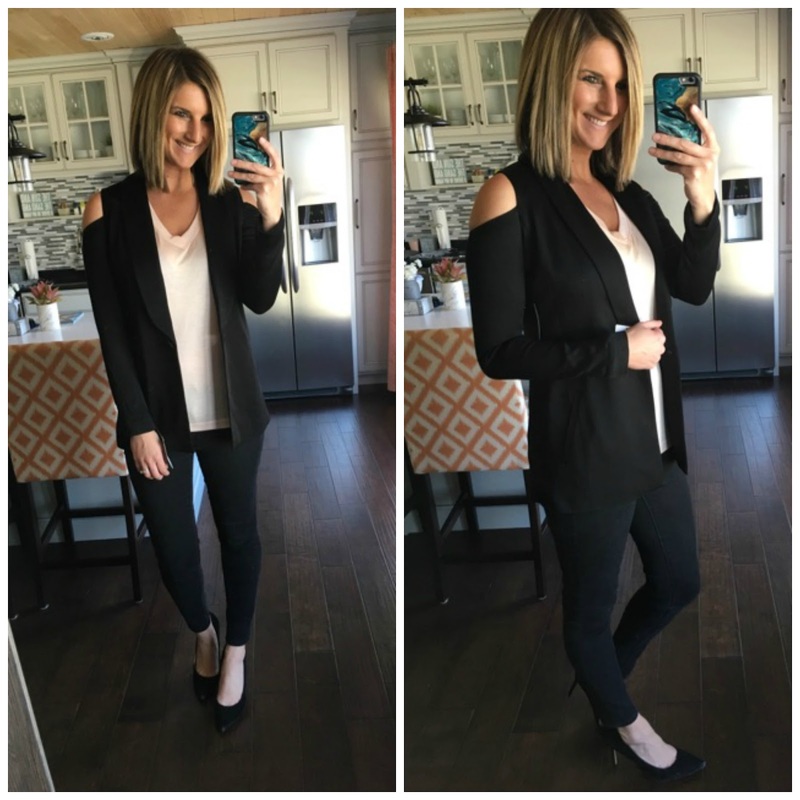 I think this is such a fun spin on a traditional blazer and gives this business look a little edge. I think it could cute with jeans too for a night out. Wearing in XS here, it does feel a little tight up near the shoulders so I may want a small. Madewell Central Plaid Shirt, 35% OFF – The material of this is super soft and I am always down for a good plaid, however, when I put this on I couldn’t tell if it was doing anything for me or not? On sizing, I am wearing an XS here and it seems true to size! Free People Brittany Peplum Tunic, 40% OFF- I feel like I don’t know if this is supossed to be a shirt, a dress or a swimsuit coverup. But regardless, I’m not really digging it. Unless it is a swimsuit coverup in which case it could work. The arm holes are pretty big which always annoys me. Wearing in XS, true to size. Madewell Chorus Scoop Back Tee, 40% OFF – I maybe didn’t like this because it was way too small on me [wearing here in XS] but also because it was quite sheer. I do, however, love the back on this one! Sorry though shirt, back you go! Six hours later and this post is done! The pathetic thing is I’m not joking. Hence that sweating part I mentioned up top…now I’m curious, what is your favorite and least favorite thing from above? Drop a comment below or on Facebook to let me know! You can shop the rest of the entire sale here!